In an M. Night Shyamalan style turn of events, Captain America has been turned into a Hydra agent by a sentient Cosmic Cube called Kobik. It’s one of the biggest twists in the history of the House of Ideas and beginning in the coming months, Marvel is launching Secret Empire, the biggest crossover event of the year. In Secret Empire, Steve Rogers uses his new-found position as Director of S.H.I.E.L.D. to take control of the country and turn it into a fascist state run by Hydra. With such a big crossover event planned, there are several tie-ins scheduled including Secret Empire: Brave New World. In an interview with Nerdist, writer Paul Allor and editor Charles Beacham revealed that not only would the original group of Invaders be making a comeback, but an All-New version of Patriot would debut in the event. The character is even featured on the cover of the tie-in’s second issue. 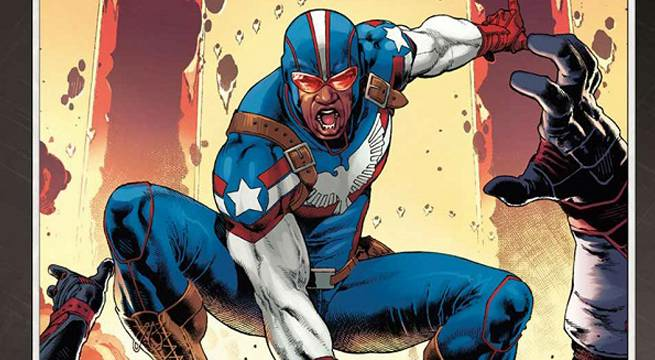 The Patriot moniker has been used between two characters — the Golden Age Jeffrey Mace and the most recent Elijah “Eli” Bradley — but neither representative from Marvel hinted at which version would be making his first appearance in a post-Secret Wars universe. Of note, Jeffrey Mace (Jason O’Mara) is currently the Director of S.H.I.E.L.D. on ABC’s Agents of S.H.I.E.L.D., so it’d be another chance for the House of Ideas to start incorporating current live-action stars into their comic universe. Both issues of Secret Empire: Brave New World are slated to be at local comic shops across the country in June.